Save fuel, save your engine! 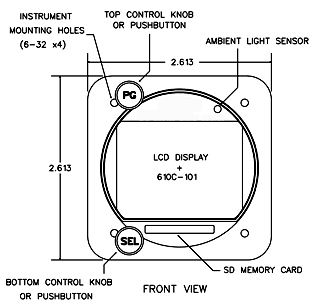 The instrument has two control knobs that operate combination rotary and push button switches. The top knob in general controls screen selection while the bottom knob controls items within the given screen. Each screen assigns its own functional needs to the controls that may change depending on context. A screen may also label the controls with guidance information like “Push to exit”. The Exhaust Gas Temperature is displayed in white bar graph form and is interpreted much like a conventional mercury thermometer. The higher the bar, the higher the temperature. The cylinder head temperature is displayed in green single bar format. During normal operation it shows as a green illuminated bar in the lower half of the bar column. Since EGT is normally higher than CHT, the green bar which represents CHT is on top of the white illuminated EGT bar and stands out clearly. However, when the engine is shutdown, the EGT quickly drops to zero and the cylinders remain warm for sometime. The G2 provides a reliable indication of cylinder head temperature even with the engine shut down. Should an EGT probe fail, the entire EGT column for that cylinder will go blank, and the numeric indication will show --- that is dashes, but the CHT bar will still remain green. The failure of one probe will not affect the display of any other probe. A key requirement of the G2 design was compatibility with previous GEM’s. We strive to never leave our loyal customers behind. Packing all the functionality of the G2 in package half the size of the original GEM took us to the limit of our patience many times but it was worth it. Fortunately its amazingly compact circuits will be built by robotic machines because most of the parts are too small to handle and too difficult to be seen by eye. Products like the modern cell phone have driven the electronic assembly technology we use a long way. 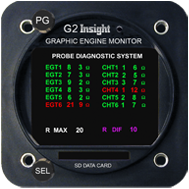 Insight the originator of the Graphic Engine Monitor surprised everyone by unveiling a new third generation GEM called G2 at Sun n Fun. By no means a luke warm sequel the G2 is a breakthrough product. Featuring a bright full color display it offers numerous screens of new functionality previously unavailable anywhere. While the original lean screen is gone a vastly improved screen replaces it with special functionality for lean of peak operation. 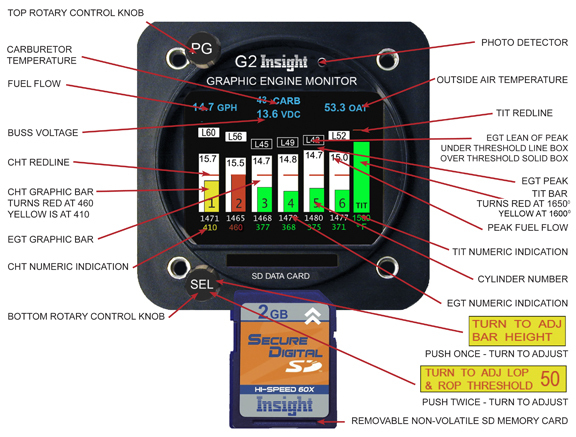 G2 logs data to readily available SD digital camera cards. A low cost card will store decades of flight data. 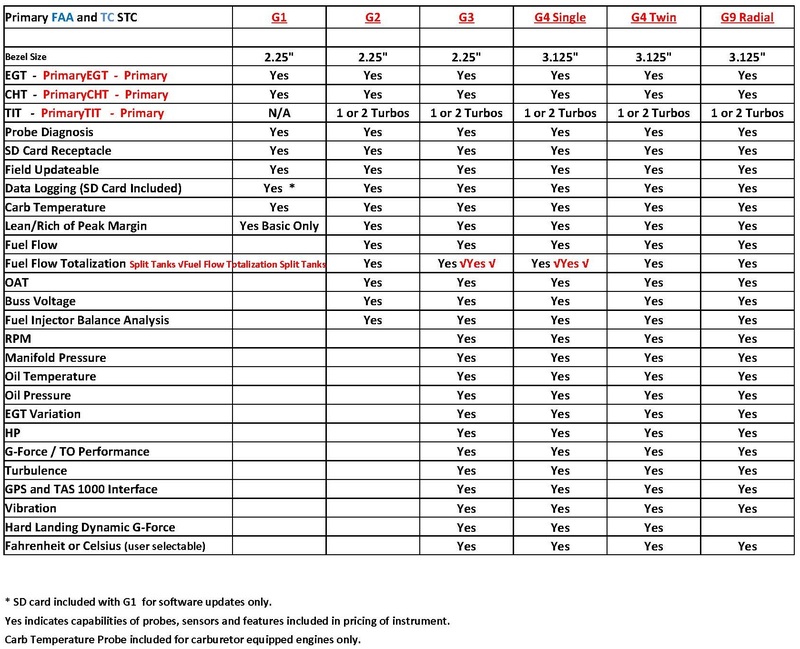 The new G2 writes PC compatible files and directories so no special software is required to process or transfer data. Despite its enormous capabilities the new G2 is a compact size and plug-compatible replacement for all 610 GEMs. Insight offers a generous GEM trade-in to make upgrades easy. Aircraft install weight - A G3 for 6 cylinder with 8 foot harness, all sensors, wiring, connectors and probes is 4.2 Lbs. The G2 Buss Voltage attempts to display the buss voltage in green when it’s normal and red when it’s outside of normal. In an aircraft with a 12V electrical system the Buss Voltage will be annunciated in green so long as the voltage is 12.0V to 14.9V (inclusive). In an aircraft with a 24V electrical system the Buss Voltage will be annunciated in green so long as the voltage is 24.2V to 28.7V (inclusive). Below this range the alternator isn’t charging the battery and above that it’s overcharging, and the Buss Voltage will be annunciated in red. The instrument must be connected to the main voltage buss (not in series with something else, on a lighting buss, etc.) and must have a good low-resistance ground connection, otherwise the voltage measurement itself will be in error causing the Buss Voltage to indicate in red erroneously. • Previously there was no standard color scheme in the configuration screens. Now the selected line is yellow and the inactive lines are white. YES/NO in red has been removed by displaying only the word YES or the word NO in green, when saving. When there is a choice of several items the selected item is displayed in green. Exactly one item is always selected. The choices of temperature units are Celsius or Fahrenheit then either Fahrenheit or Celsius will be selected in green. 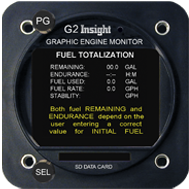 • The FUEL TOTALIZATION screen has been improved and is even easier to use. 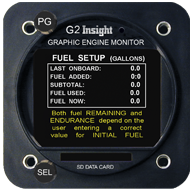 This change allows the pilot to see this screen before entering fuel on board. Also setting initial fuel can be checked and corrected in flight. Previously the pilot had to enter the amount of fuel onboard before he could view the FUEL TOTALIZATION page. Now both the FUEL TOTALIZATION page and the FUEL SETUP page are accessible at any time. On the FUEL TOTALIZATION screen simply press the PG (left) button to enter fuel, press it again when done. As before you can top up the tank(s) by turning the SEL (right) knob counter clockwise on the very first click. To reach FUEL TOTALIZATION screen from the main screen. Turn the PG knob counterclockwise one click. On FUEL SETUP screen setting fuel gallons the lines FUEL ADDED, SUBTOTAL and FUEL NOW color will be yellow. At anytime you can push PG knob to go back and forth between the FUEL SETUP and FUEL TOTALIZATION screens to add more fuel. The Fuel Remaining display on the GEM is very useful but is not without limitations. Understand first that the factory fuel quantity gauges are the only instruments in the panel that physically measure fuel level. They are still the primary indication of fuel level in the airplane. The GEM doesn’t measure level, but instead measures only fuel flow rate. The GEM totalizes the rate information to account for fuel used. If you know how much fuel you started with and how much you have used you can figure fuel remaining by simple subtraction. The pilot must supply an accurate starting fuel level for this subtraction to produce the correct fuel remaining result. Should the pilot overstate the fuel quantity on board, the GEM will dangerously overstate the fuel remaining and the endurance time as well. The pilot must be careful and diligent when setting the fuel on board. Getting the correct fuel total on board is in many cases pretty easy. If you fill up prior to takeoff the number is obviously the total available on board. If you partially fill a known configuration (say tips empty) then the total is easy to calculate. If you partially fill fuel tanks or add an accurately know quantity to a poorly known original value - errors will abound. Unaccounted fuel loss from leakage, fuel vent overflow or theft will of course produce erroneous results. So be careful and the GEM will deliver safe, reliable, and convenient fuel information. 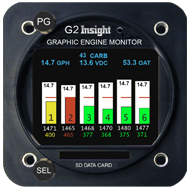 But be sure to cross reference the information on the primary fuel quantity gauges. Never trust a single source of fuel information when you have two on board. Fuel exhaustion still ranks highly among accident causes. Don’t let your engine stop until you’re parked.